Having so many posts on "global menus", you probably know by now what a "global menu" is. If not, take a look at the above screenshot. Ubuntu 10.10 Netbook Edition comes with a global menu (not Gnome2 Globalmenu but its own "global menu") which works with some Qt applications as opposed to Gnome2 Globalmenu, however Gnome2 Globalmenu is still better for GTK applications (for now anyway) as it allows far more customizations then the Ubuntu global menu. But this is not a post on pros and cons for these 2 applications but about installing Gnome2 Global menu in Ubuntu 10.10 Maverick Meerkat. You could already install Gnome2 Globalmenu in Ubuntu 10.10 but you had to manually download and install 4-5 .deb files which is not exactly user friendly. Besides, a new version was released a couple of days ago and it's not available in the Gnome2 Globalmenu PPA - reason for which I've decided to upload this new version (0.7.10 - unfortunately I didn't find any changelog for this version and also I don't see any visible new features) to the WebUpd8 PPA. Before installing, please note that the latest version - 0.7.10 -, does not come with XFCE packages anymore (that's because of the Gnome2 Globalmenu, not due to my packaging). Important: I've experienced some issues with the Linux Mint 10 default theme (Mint-X theme) so if you want to use this theme, it's better not to install/upgrade to the latest Gnome2 Globalmenu! However, all the other themes I've tried worked! 2. Restart the computer. Do not just log out - that won't work. And finally, right click the Gnome Panel, select "Add to panel" and add "Global Menu Panel Applet". 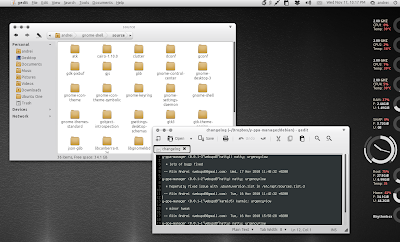 For older Ubuntu versions, you can use the Gnome2 Globalmenu PPA.